One of the most complex and desirable grand complications, the tourbillon is a source of pride for the watchmaker and a sign of prestige for the owner. Here are 10 renditions of the gravity-correcting spinner that make quite an impression this year. The Royal Oak Offshore Tourbillon Chronograph has been completely reimagined with 8 architectural bridges that appear to extend out from the bezel and support important parts of hand-wound Calibre 2947. The way the titanium bridges are shaped, it gives the illusion that the dial is sunken, with the hands suspended above it. Sandblasted and satin-finished surfaces add to its industrial allure. Boasting an unprecedented slimness of 3.95mm, it is the thinnest automatic watch with a tourbillon, a feat made possible by the ball bearing system of the flying tourbillon. The space is also reduced by moving the oscillator to the periphery of the movement. Its combination of gold and aluminum, and their contrasting density, ensure there is no slack in winding performance, which can store up to 52 hours of power. A titanium case completes this vision of industrial slenderness. The Bubble, with its domed crystal and spacious dial space, is perfect for showcasing the tourbillon literally front and centre. The magnifying effect of the domed crystal brings out every little detail of the titanium tourbillon. For an unimpeded view, there are no hands and time-reading display is moved to the flange. And since the tourbillon completes one full rotation in one minute, it works just as well as a seconds display. The Neo Tourbillon reinterprets Girard-Perregaux’s iconic three bridges, which have been around since 1884, in a new shape - rounded, arched, taut, openworked and black. At 45mm in diameter and 15.85mm in height, it is a hefty watch, all the better to admire the architectural bridges. But there is also an unmistakable sense of lightness thanks to the absence of a baseplate, which is replaced by two similarly shaped bridges that support the mechanical parts at the back of the movement. Other than the fact that it combines two grand complications in one watch, which is already a rare feat, the most striking thing about this watch is the abstract mosaic blue dial in a square case. The hypnotic spin of the flying tourbillon can be viewed behind the skeletonised bridge at ‘6’, making this timepiece both a visual and sonic treat. A complication as mesmerising as the tourbillon is hardly ever hidden but this Big Bang watch has taken that openness further with the case, bezel and dial crafted entirely from sapphire crystal. The luminous transparency reveals the inner working of the manual HUB6016 movement in all its glory, including the spinning skeleton tourbillon at ‘6’. Limited to 15 pieces, it is the first time that the in-house manual 94805 calibre that boasts 96-hour power reserve is incorporated with a constant-force tourbillon. A patented mechanism ensures an even transmission of impulses to the escape wheel, even as power is being drained. One of the five new limited edition Portugieser watches to commemorate the manufacture’s 150th anniversary, it also boasts a moon-phase and comes in a platinum case with white or blue lacquered dial. With the flying tourbillon positioned prominently at ‘6’, one side of the watch features a blue sunray dial; the flip side reveals a grained sub-dial displaying the second time zone. The latter also displays the small seconds courtesy of the tourbillon as well as the day/night, peeking out discreetly at ‘2’. 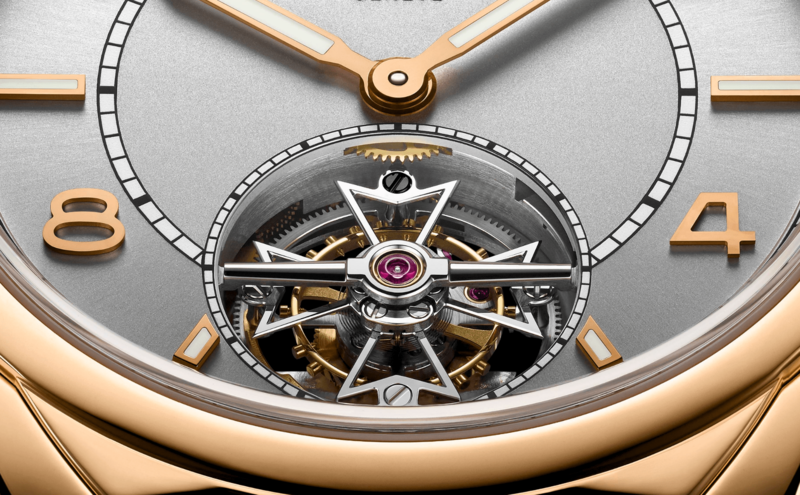 To maintain the Art Deco slimness of the platinum case, the tourbillon is constructed with the ball-bearing system. A good design elevates aesthetic pleasure, and Ulysse Nardin has done that brilliantly with this timepiece where the mechanical parts appear to be “floating” on a black dial. The illusion is helped along by a unique protective crystal, shaped like a domed box and painstakingly polished for absolute transparency. The tourbillon, fitted with the in-house anchor escapement, is shaped uncharacteristically like a boomerang. There are two versions to choose from: a white gold case with honeycomb dial and a rose gold case with a dial cut from a slab of black stone. The Fiftysix collection is a direct descendent of the Ref: 6073 from 1956, one of the first watches from the manufacture to feature an automatic watch and a water-resistant case. Distinguished for its elegant classical design, the Fiftysix now boasts its first grand complication in the form of a tourbillon in an ultra-slim movement with a 22k gold peripheral rotor. Available in 41mm 18k gold case with brown Mississippi alligator strap, the tourbillon features the manufacture’s signature Maltese cross design and requires dozens of hours of meticulous finishing, the result of which can be fully admired via an opening at ‘6’.